May 18th, 2018 San Jose .- Costa Rica- The 2018 FIFA World Cup will be taking place in Russia from June 14th through July 15th. Superior Casino & 24VIP Casino players, as well as Superior Share affiliates, are invited to join in the World Cup fervor with two dedicated and rewarding events, which include free spins for players and Android devices for affiliates. The World Cup is the most popular and highly anticipated sporting event on earth, gathering 32 countries worldwide to compete for the coveted 18-carat gold trophy and the ultimate soccer bragging rights. This quadrennial football tournament is disputed by the men’s national teams of the member associations of FIFA, including squads from 5 confederations of countries like Spain, Australia, Argentina, Brazil, Costa Rica, Mexico, Germany and England. In less than a month, the world will be going soccer-mad with games taking place in 11 host Russian cities. Some of the biggest stars that will be making their marks this 2018 include names like Lionel Messi, Gerard Piqué, Harry Kane, Toni Kroos, Neymar and Cristiano Ronaldo. From June 14th through July 15th, existing and new Superior Casino & 24VIP Casino players are eligible to play with up to 1000 Free Spins on the soccer-themed slot Global Cup Soccer powered by Rival Software. A small $25 deposit rewards players with 400 Free Spins and a $50 deposit grants them more than double that amount, totaling 1000 Spins. Superior Share affiliates will also be part of the World Cup fever with a chance to enter a draw where they’ll be playing for 3 Android gadgets: a 1st prize TV Box, a 2nd prize Google Speaker and a 3rd prize Drone. 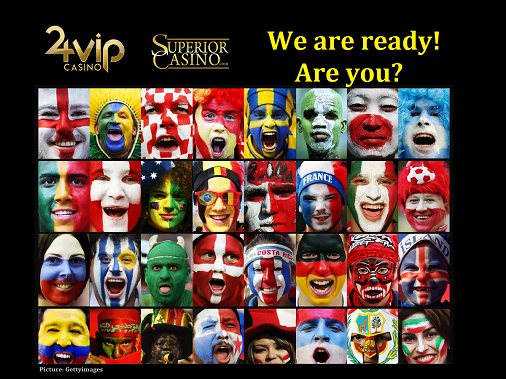 We invite online casino affiliates to sign up at SuperiorShare to promote our brands during the world cup and also be part of our world cup contest. New affiliates must open their account before June 14th.